After a harrowing two weeks, America’s national nightmare has ended with the adoption of the helpless pup (Lamby) abandoned by the super-important, super-influential, super-talented Lena Dunham. It has never been clarified if Ms. Dunham abandoned the homeless cur because she mistook the shelter dog for a sheep and, when she found out that the pup was actually a canine who simply needed protection by an honest, responsible and nurturing human being, she realized her mistake and decided to dump the homeless pet. Nor were the lies that Dunham told about the dog’s history retracted by the young socialite superstar. Even still, America breathed a collective sigh of relief upon Yahoo’s reporting that Lamby has found a new home. 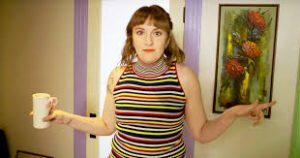 Now that that’s over – America has decided to put Lena Dunham up for adoption. Lena is a troubled young human who needs to be adopted by someone who can give her the appropriate “time, energy, training and daily care,” so she can “slowly and carefully” be properly socialized and weaned of her destructive selfish, thoughtless and egocentric behaviors. Reminding any country (or other planet, for that matter) that may be caring enough to think about taking in the troubled human that the adoptee, Ms. Dunham, is “developmentally not all there,” and may need occasional “gentle reminders” regarding compassion, humility responsibility and basic humanness, professionals believe that Ms. Dunham may well recover given proper “socialization”. Reflecting the general level of compassion of our society, Americans felt that euthanizing the problem human would be simply too callous and self-serving, and re-homing Dunham seemed to be the most humane option.